The award-winning Jonesville Tennis Center in Gainesville, Fla., will on Oct. 1-7, 2012, host its first-ever women's professional tennis tournament on the USTA Pro Circuit calendar. The $10,000 prize money event will feature a 32-player draw and a qualifying draw, drawing competitors from around the world in search of WTA Tour ranking points. "We are very excited to host a women's professional event in Gainesville again after so many years," said Jonesville Director of Tennis Dave Porter. "We hope to grow this event and to provide an exciting atmosphere for the players and spectators for years to come." The USTA Pro Circuit $10,000 events feature up-and-coming players looking to establish a ranking, or work their way up the rankings to get into the qualifying draws of WTA Tour events and Grand Slams. The Jonesville event will feature a number of up-and-coming American players who gain direct entry, as well as players who will receive wildcards into the event at the discretion of the tournament director. On the USTA Pro Circuit women's calendar, the Gainesville event will be preceded by a $10,000 women's tournament in Amelia Island, Fla., and a $50,000 women's tournament in Las Vegas, both beginning Sept. 24, and then followed the week after Gainesville by a $25,000 women's tournament in Troy, Ala.
With approximately 90 tournaments hosted annually throughout the country and prize money ranging from $10,000 to $100,000, the USTA Pro Circuit is the pathway to the US Open and tour-level competition for aspiring tennis players, and a frequent battleground for established professionals. The USTA launched its Pro Circuit 33 years ago to provide players with the opportunity to gain professional ranking points, and it has since grown to become the largest developmental tennis circuit in the world, offering nearly $3 million in prize money. Last year, more than 1,000 men and women from more than 70 countries competed in cities nationwide. Andy Murray, Mardy Fish, James Blake, and former No. 1s Maria Sharapova, Andy Roddick, and Caroline Wozniacki are among today's top stars who began their careers on the USTA Pro Circuit. 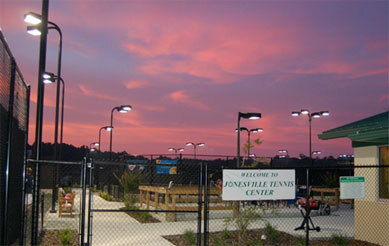 The Jonesville Tennis Center, constructed in 2009, won the USTA national 2011 USTA Outstanding Facility, recognizing facilities whose efforts make a positive statement about the vitality of tennis through adult and junior tennis programming, overall facility and court construction and layout, and contributions to the game of tennis. In addition, the Jonesville Tennis Center received the 2011 Featured Facility Award, presented to the one facility (among those chosen to receive the USTA Outstanding Facility Award) that demonstrates exceptional excellence in facility design, court construction, amenities and related components, and promotes high standards in tennis facilities that enhance the enjoyment of tennis in their local area. The award also recognizes the facility as an early adopter of the 10 and Under Tennis format. The tennis center occupies part of a 100-acre parcel of land that was formerly a University of Florida agricultural research station. It was acquired by Alachua County for use as a multi-purpose park, now called Rotary Park at Jonesville, including soccer and other sporting fields. The tennis facility includes 14 lighted clay hydrocourts (including one larger show court), one beach tennis court, and the pro shop and storage building. The facility received more than $7,500 in grant support from USTA Florida. For more information on the ITF and USTA Pro Circuit structure, go to www.itftennis.com/procircuit/tournaments/circuit-info.aspx. Strawberries and Cream, white attire and grasscourt tennis came to Coral Reef Park in the Village of Palmetto Bay, Fla., just south of Miami, as local adult players improvised their own grasscourt tennis event for the second straight year. 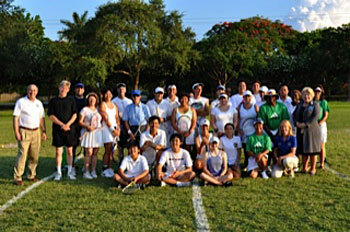 The 2nd annual Wimbledon Night was played at Coral Reef Park on the low-cut grass field on June 29, 2012, featuring 60-foot courts painted on the lawns with white lines, and 18-foot mini nets used in the park's 10 and Under Tennis program. Head pros Leroy Pettis and Kara Borromeo organized the event that was open to all adult players, intermediate levels and above, utilizing the foam balls used for beginner children in the 10 and Under Tennis program. "The foam balls bounce really well on the grass," said USTA Florida Miami-area Tennis Program Coordinator Cathy Nordlund. The draw for the event consisted of 12 teams of 24 players, with 8-point matches played in each round. "At the end of the night, the points were totaled for each team, and first and second place prizes were awarded," Pettis said. "A great time was had by all, especially at the end of the night when strawberries and cream and other refreshments were catered by Baguette Box. A number of prizes were also raffled off. Overall, the event was a complete success and everyone had a blast!" Holy Names University in Oakland, Calif., is beginning a women's tennis program for the 2012-13 season, and looking for players from Florida to fill the top positions on the team. Holy Names is a Division II school that competes in the PacWest, one of the strongest Division II conferences in the country. PacWest teams currently ranked in the Top 15 include No. 1 Byu-Hawaii, No. 5 Hawaii-Pacific, and No. 13 Grand Canyon. For the 2012-13 season the No. 2-, 5-, and 9-ranked NAIA teams will also be joining the PacWest. "We can offer anywhere from 70-95 percent of a full scholarship, depending on grades and their financial situation for the right player," said head coach Scott Howard. "Incoming players will have the unique opportunity to build a program from the ground level and to be forever remembered, while playing top level competition immediately." Holy Names will also be starting a men's tennis program in 2013-14. HNU is located in the scenic Oakland Hills, 15 miles east of San Francisco. The school offers a variety of majors, and is well known for its programs in Biological Sciences, Multimedia Arts and Communication, Nursing and Liberal Studies. For more information contact Scott Howard at jscottiehoward61@yahoo.com. USTA national has announced that the 2012 US Open purse has been increased by more than $2 million dollars to reach a record $25.5 million. Additionally, the top three men's and top three women's finishers in the Emirates Airline US Open Series may earn up to an additional $2.6 million in bonus prize money at the US Open, depending on their performance over the course of the summer series. With this bonus money, the total US Open prize money could potentially reach $28.1 million. To support the majority of players in the early rounds, for 2012 the prize money has been increased by a minimum of 18 percent for the first three rounds of the main singles draw. "We recognize the mounting financial pressures associated with competing on the global professional tennis circuits and especially for those who do not reach the second week of the US Open," said USTA Chairman of the Board and President Jon Vegosen. "We believe the additional prize money, as well as how it will be strategically distributed, will help alleviate some of the pressure." Both the men's and women's US Open singles champions will earn a record $1.9 million with the ability to earn an additional $1 million in bonus prize money (for a total $2.9 million potential payout) based on their performances in the Emirates Airline US Open Series. The 2012 US Open purse includes an 11 percent overall increase in men's and women's main draw singles prize money over last year's total. First round main draw singles prize money has been increased by 21 percent, and second round main draw singles prize money has been increased by 19 percent. The Emirates Airline US Open Series is the six-week summer tennis season linking 10 major ATP World Tour and WTA tournaments to the US Open. Since its inception in 2004, the Emirates Airline US Open Series has doubled television viewership and increased event attendance, while generating new corporate partnerships for the sport. Last year, Mardy Fish and Serena Williams won the Emirates Airline US Open Series. The 2012 US Open will be held Monday, Aug. 27 through Sunday, Sept. 9. Qualifying begins on Tuesday, Aug. 21. Tickets for the 2012 US Open can be purchased four ways: 1) at USOpen.org; 2) by calling Ticketmaster at 1-866-OPEN-TIX; 3) at all Ticketmaster outlets; or 4) at the USTA Billie Jean King National Tennis Center box office. The United States Tennis Association (USTA) national body announced the 14 winners of the 14th annual NJTL Arthur Ashe Essay & Art Contest. The recipients, ages 18 years old and younger, were selected from 1,810 submissions earlier this month. Each winner will receive a New York City travel package from Aug. 24-26, 2012. West Palm Beach's Omar Shalabi was the winner in the Boys Art 10 and Under division. To enter the contest, children were asked to write an essay of 350 words or less, or create an art piece, responding to a specific question around Arthur Ashe and his accomplishments. This year's question was, "If Arthur Ashe were alive today, what do you think would give him hope?" A USTA national sub-committee selected the winning essays from over 1,100 submitted based on their knowledge of Arthur Ashe, message clarity, and writing style. The winning art pieces, which included over 700 submissions, were also selected based on their knowledge of Arthur Ashe and creativity. "We are truly proud to recognize this year's Arthur Ashe Essay & Art Contest for their ability to define Ashe's legacy and his passion for uplifting youth through tennis and education," said USTA Director for Community Outreach & Education Karin Buchholz. "As students of NJTL chapters from around the country, their work shows the lasting and positive impact that tennis and education has on their lives, which is what Ashe hoped for all along." The winners receive round-trip airfare to New York City for themselves and a parent/legal guardian; two nights stay at the Grand Hyatt 42nd Street, and President's Box tickets to the 2012 Arthur Ashe Kids' Day presented by Hess on Aug. 25, 2012, at the Billie Jean King National Tennis Center. The weekend will wrap-up with an awards luncheon on Aug. 26, hosted by former New York City Mayor and USTA Board Member David Dinkins, where the winners will receive an honorary plaque. Founded in 1969 by Arthur Ashe, along with Charlie Pasarell and Sheridan Snyder, the USTA/National Junior Tennis & Learning (NJTL) network is a nation-wide group of more than 660 non-profit youth-development organizations that provide free or low cost tennis, education and life skills programming to more than 250,000 children each year. 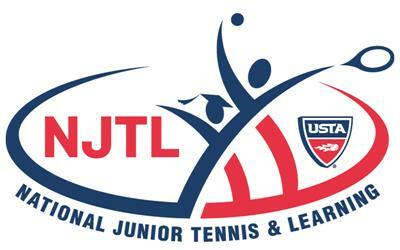 Celebrating its 43rd anniversary this year, NJTL is one of the USTA's largest community-based offerings. Team Flo-rid-a entered the final round of pool play undefeated against the undefeated 4 seed Texas section. 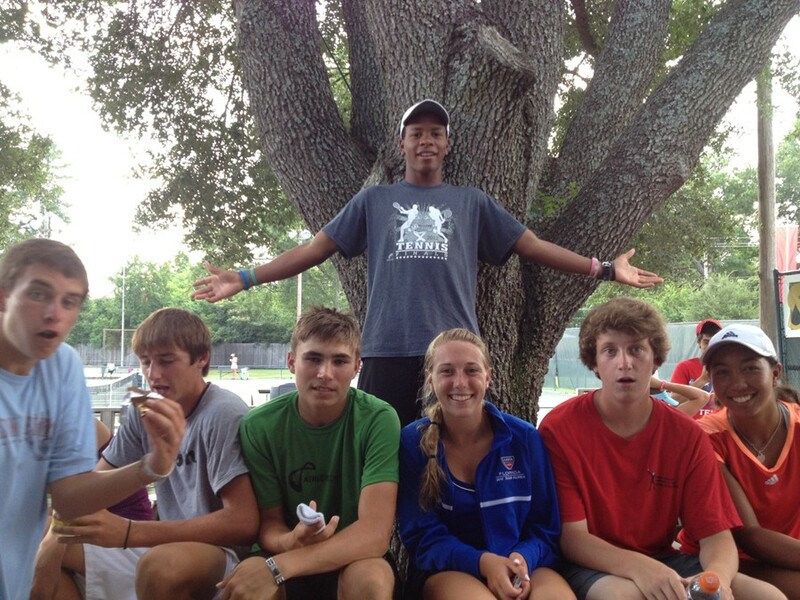 The singles provided incredible drama for the teams, coaches, and fans at the Pierremont Oaks Tennis Club. Important side note: since day 2 matches were postponed due to rain from Monday evening, the executive decision was made that all matches would go to a match tiebreak in the 3rd set. The number one singles positions took the courts first at 1130am. Langmow and Horvit both were down by 3 game margins early in the first set. But they battled back to get back on serve and then Horvit took the first set 7-5 after a 90-minute first set. Langmow went down 4-6 55 minutes in. Meanwhile the other lineup spots were on court and Flo-rid-a took an early lead on all the courts winning the first set on 3 of them. Momentum in games and sets provided a riveting scene as the swings were grand in nature. Both teams would not relinquish any point or lead without a fight. Texas battled back on every court to win the second set and force a third set tiebreak on 5 of 6 singles matches. The only straight set win came from Horvit at the girls 1 position. She won 7-5, 6-2 in a 2 and 1/2 hour match. She put us on the board to bring the team score to 1-2. Texas won 3rd set tiebreaks at the boys 1 singles 6-4, 5-7, 10-4 and at the girls 2 singles 2-6, 6-1, 10-5 to take a 2-0 lead by 1:40 in the afternoon. Horvit stopped the momentum and put the tide in Flo-rid-a's favor. Allwerdt would even the score at the boys 2 position with a 6-4, 5-7, 10-3 win. He won the last 9 points in the match tiebreak to finish the match. The teams are tightly wound in what feels like an unbreakable knot. How do the remaining matches play out? The girls 3 singles position was the slip in the knot. Brigante won the first set for Flo-rid-a 6-3 but relinquished the lead 3-6. The match tiebreak was at 5-5 when Brigante went up 7-5 with aggressive play. Texas responded with more aggressive play and won 4 straight points. Texas would close it out with a 10-8 winner that skidded off the sideline tape in the ad side to slip them into a 3-2 team lead. The final single match was at the boys 3 position. Madonia won the first set 6-4 after being down a break early to put Flo-rid-a up. Then Texas elevated to another stratosphere to win 6-0 in the second. Madonia was unfazed and started the match tiebreak with relentless groundstrokes. He knew the team score and told me that he was excited and ready to even it for his mates. He then went out and executed under pressure with supreme confidence and determination. He went up 7-1 and 9-3 in the tiebreak and then closed it out by forcing an error to win 10-7. The knot is back at 2:53pm. Doubles was scheduled for a 4pm start. The team ate and rehydrated and finally started to take the court at 5:15pm. The boys doubles and mixed doubles went on first. Unfortunately, after 30 minutes in Flo-rid-a was down a set on both courts. 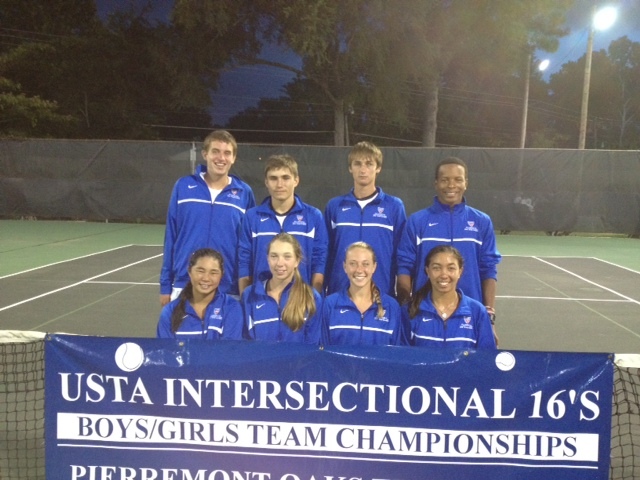 Neither team would rally and Texas clinched at 5-3 on the mixed doubles court by 6:45pm. 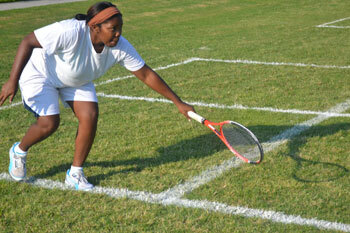 The girls doubles was underway by this time and the team of Makarome and Horvit took the first set 6-3. Texas battled back as they always do and won the second 7-5. Then they picked up the tempo and execution to close out the match tiebreak 10-2. Flo-rid-a is back on court competing for the prize of 5th place Wednesday morning versus the Cinderalla section of the tournament, Northern California. We play at 11:30am with singles. The doubles follow at 4pm. Quack. Quack.